Isn’t this the most adorable 1950s repro skirt you have ever seen? The pattern originated from John Wolf in the 50s where Poodle dogs and puppies were put onto boarder prints for skirts and aprons. 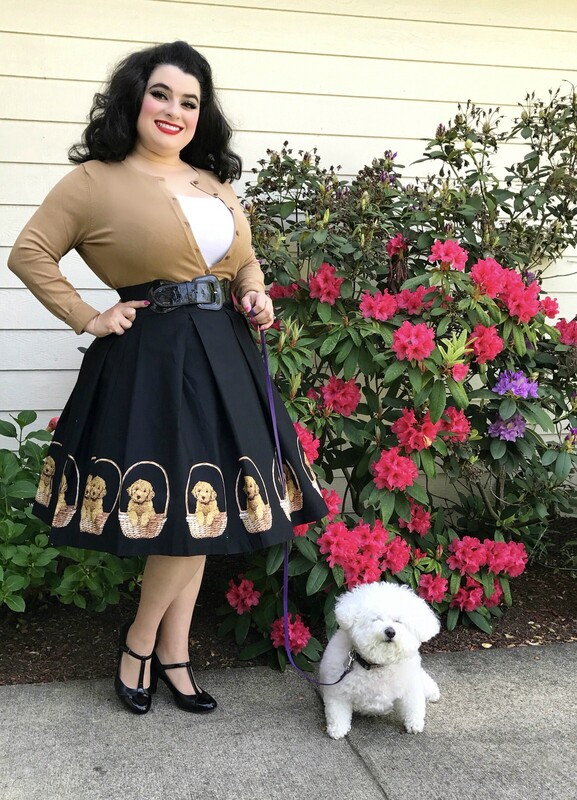 My heart started to sing when I saw this darling Puppy in A Basket print skirt from Dangerfield Clothing. Dangerfield Clothing is a popular alternative Australian fashion brand with two additional labels Revival and Princess Highway. This puppy in a basket skirt is from their Revival label. The skirt comes in black and a lovely olive green color. The boarder print features the cutest little golden puppy dog sitting in a basket. I immediately had to have both color-ways and didn’t hesitate ordering as these prints sell out quickly. I am in California and Dangerfield is in Australia so I rely on their online size guide. The good news is that this year they have expanded their size range to size 18 so us curvy girls of the world can dress in these dreamy prints!! I ordered the skirts in size 16 and shipping to California is no joke about 7 days or less and not at all outrageous in cost. The skirt length hits me below the knees so it is a tad shorter than a 50s circle skirt but still long enough to add a nice fluffy petticoat (and I have a petticoat on). Dangerfield also has a matching puppy in basket blouse and this one also comes in a dress. The fabric is a nice cotton so it is light enough for summer weather into Fall but, does not wrinkle as much as some other skirts I have purchased so that is a total win. The skirt holds it’s pleated shape very nicely. I am excited to share some pictures (more to come) with you all. Even my Bichon Frise puppy dog Luna was excited to be part of the photo shoot. Pics by my hubby Gary Greco. 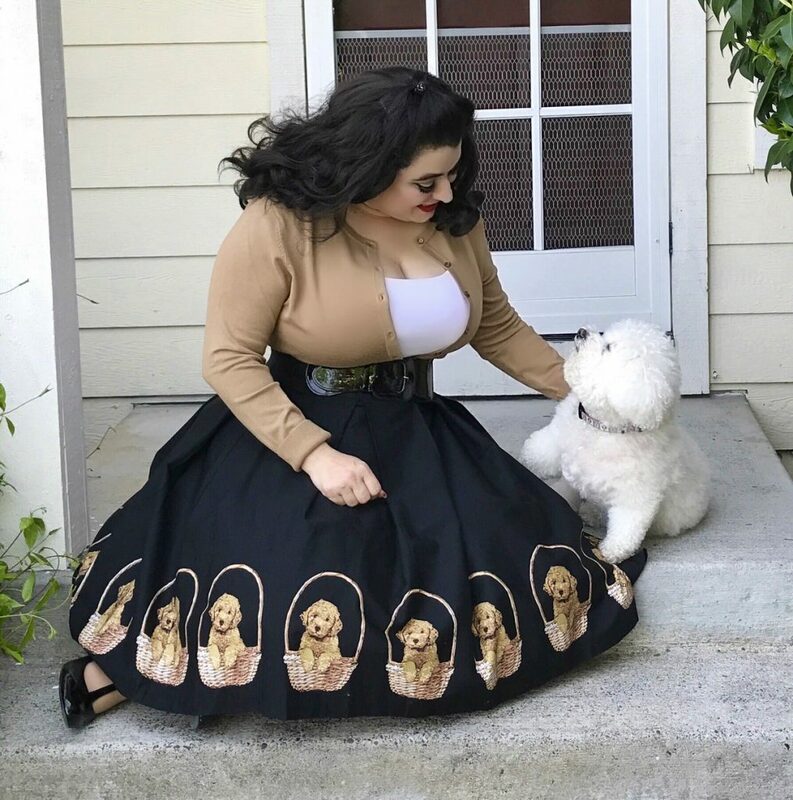 If you love kitschy novelty prints in alternative, rockabilly and pinup girl styles like I do, then check out Dangerfield Clothing, they stock new novelty prints regularly and you will certainly stand out in a crowd! !